Online Giving is now available for your convenience! Click the button to begin. Thank you for your support and generosity! Submit a name of a loved one who is ill or has deceased. Names will be printed in the parish bulletin for the prayers of our parish community. Click here. In accordance with the bishops of the United States and the requirements of the Diocese of Fresno, all volunteers who have access to children must complete a background check and Safe Environment training. To log in, go to https://safeandsacred-fresno.org. Click "Create new account" to register. 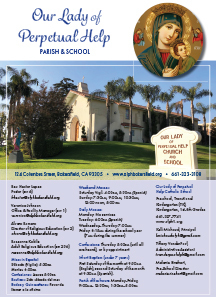 When completing the registration fields, choose "Church - Our Lady of Perpetual Help, Bakersfield" and select "Parish volunteer" for registration; then click "Create my new account." Finally, click "Continue" to confirm your account and enter the training site. Enjoy videos from Catholic news sources around the web! Updated weekly.